Les Houches chalet and luxury apartments with swimming pool, ski holiday accommodation rentals, ski gites for letting, self-catering apartment to let for skiing holidays in Les Houches, near Mont Blanc. Our ski apartments in Les Houches are for up to 8 people and include access to a gorgeous swimming pool and leisure area. You do need to book them early, particularly for February half term and New Year. Les Houches is a ribbon village located at the southern end of the Chamonix Valley and forms part of the Mont Blanc ski area which is covered by the Mont Blanc Chamonix ski pass. It has a lovely combination of stunning views, open slopes and meandering tracks through the trees which allow for good skiing whatever the weather. There is a friendly, family atmosphere about Les Houches and it is just a short, 6km bus ride round to the famous resort of Chamonix. Les Houches is a good resort for beginners and intermediate skiers, it lies at an altitude of 1000 metres and the ski lifts take you up to 1860 metres. In Les Houches, there are 55km of groomed ski runs, including 5 beginners slopes, 12 intermediate and 1 black which hosts one of the world’s most challenging downhill races, the Kandahar, each year. 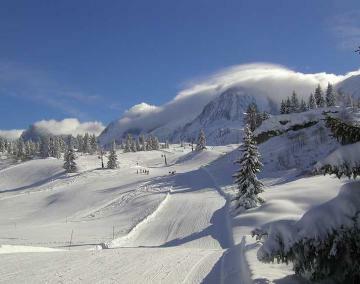 We have 3 chalets & apartments in Les Houches. Les Houches is located about one hours drive from Geneva, which has direct flights from Leeds, Luton, Birmingham, Gatwick, Manchester, Bournemouth, Liverpool, Stanstead, Bristol, Glasgow, East Midlands, Edinburgh, Cardiff, Belfast, Southampton, Exeter, Isle of Man and London City with either Easyjet, Jet2, British Airways, BMI baby, Baboo or fly Thomas cook. Although Les Houches itself is a relatively quiet resort you can still enjoy the village atmosphere as well as the fun of lively neighbour Chamonix. There are shops, bars and restaurants along with an excellent ski school. Les Houches is an ideal resort for families.